Cranberries have long played a role in helping many women, particularly those with recurring urinary tract infections (UTIs), to promote better bladder health. In fact, some 50 percent of women report drinking a lot of cranberry juice when they suspect they have a UTI, according to a survey conducted for Cystex. But drinking eight glasses of cranberry juice is not enjoyable or tolerable, and can be loaded with sugar and calories. A clinically-proven alternative is just one tablespoon of new Cystex Liquid Cranberry Complex with Proantinox taken daily to promote urinary tract health, which can benefit millions of women most susceptible to recurring, painful urinary tract infections. 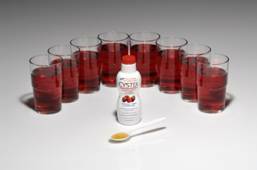 Cystex Liquid Cranberry Complex combines the health benefit of eight glasses of cranberry juice in one tablespoon of its unique, convenient Proantinox cranberry formula. More than just cranberry concentrate, its proprietary blend also contains D-Mannose (from cranberries), bromelain (from pineapple), inulin, and vitamin C, a combination designed to boost bladder health. More information on preventing and managing UTIs is available at www.cystex.com.